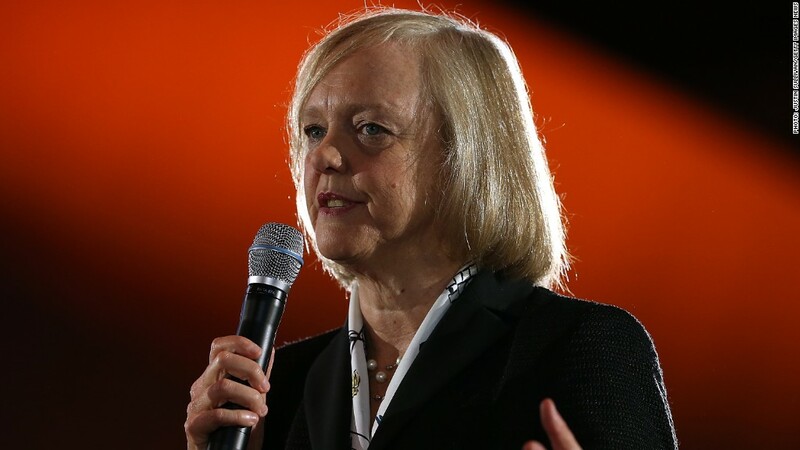 Meg Whitman, the CEO of HP, has led a restructuring of the company. The next step for computing giant Hewlett-Packard's restructuring may be a split into two companies. The Wall Street Journal, citing unnamed sources, reported Sunday that HP (HPQ) plans to put the PC and printer operations under one roof and its business that provides software and services to corporate customers under another. The Journal said the announcement could come as soon as Monday, and that the separation would take place next year. HP spokeswoman Sarah Pompei declined to comment on the report. The split follows a number of spinoffs and breakups this year. Most recently, eBay (EBAY) announced on Tuesday it would spin off the online payment platform PayPal, which it bought in 2002. Meg Whitman, the CEO of HP, took the helm in 2011 and unveiled a five-year restructuring plan. That included a major overhaul of the printer and PC business in 2012. Layoffs then and since have totaled at least 45,000, and HP projected savings of $4.5 billion per year. Her predecessor, Leo Apotheker, considered a corporate split similar to the one the Journal reported, but he left the company after only 11 months. Whitman would have leadership roles at both companies, the Journal said. She would be CEO of the enterprise business and chairman of the hardware company. In particular, Connaughton said, the move would put renewed focus on enterprise services, "where they have incredible margins," sometimes upwards of 20%. HP is among the top five performers in CNNMoney's Tech 30 index, which tracks significant tech companies. Its stock has climbed nearly 26% this year, bolstered by earnings that have climbed even as sales slumped.